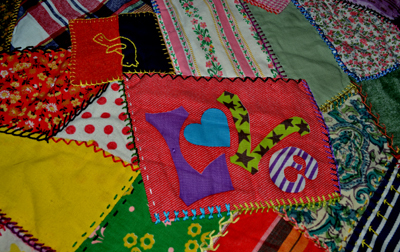 Little House Home Arts: Domestic Home Hearts Called to Sew Love! A little late but not forgotten, my heart goes out to Colorado! My relatives are on higher ground and came out unscathed, though I am still checking on a girlfriend that lives south of some of the major flood areas. Many have not been not so fortunate! It has only been a couple of years since Irene's rains took out hundreds of roads here in Vermont, with all-too-common-reports of neighbors in their homes floating by, only to find themselves in someone's back yard. Farm lands were stripped leaving fields looking like they had been stone bedded rivers and many communities were hard hit and left stranded for a time. Still our state's losses were small in comparison to what is happening in Colorado. Fortunately only a few lost loved ones in our storm, whereas Colorado reported over one thousand missing! With this news, preceded by Syria annihilating its own people, and followed by yet another murderous shooting spree, I cannot help but think that if only our domestic home hearts could bind up this sorry world wrapping it in comfort and love, what a better world this would be. 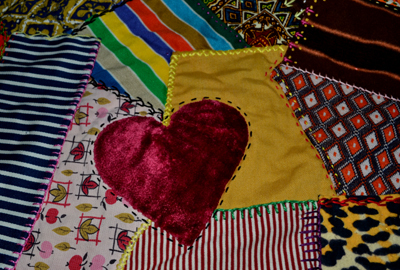 Love is truly the only power that heals and has the potential to prevent these evil tragedies.....Sew love my friends, sew love!